Note from GuitarAttack: This is a great story. Lots of great techniques and we do love a good bass. 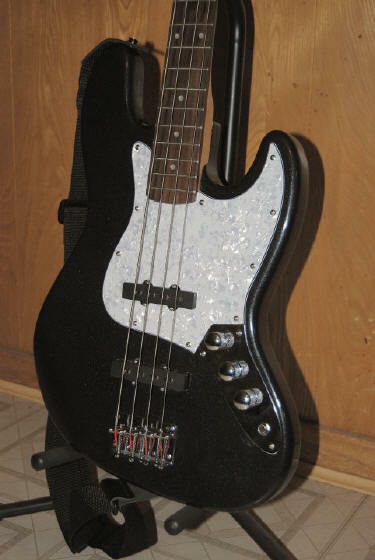 It took awhile, but I finally broke down and got the Jazz Bass Saga for my son as a 2010 Christmas project. I was surprised at the quality of the parts for that cheap of a price on eBay. I studied various sites on the net including this one for paint ideas and upgrades. The body came very clean and sealed ready for painting. No blemishes whatsoever. I did have to very lightly enlarge the bridge pickup cavity with a Dremel & router attachment. Also, reshaped the pick guard at this area as well. My son decided on a black paint scheme and I decided to add pearl to that especially around the edge. Broke out the Iwata and spent one day painting. The paint brand is Createx airbrush from TCP Global. It was somewhat difficult to work with, but it eventually got the job done. Originally it was to be a faux dark diorite look, but the white acrylic kept plugging up the airbrush tip. All black paint then I misted in the clear pearl coat getting heavier towards the edges. Finally, I sprayed several good coats of clear lacquer on the body. Let it sit 10 days to cure then rubbed it down with wet 400, 600, 1200 and then an automotive polish followed by a wax polish. That was done by hand since I have no electric buffer. While the photos don't do justice it does have a beautiful mirror finish. I replaced the pick guard with a white pearl guard and of course had to re-drill the guard screw holes in the body as well as touch up the clearances on the guard itself. 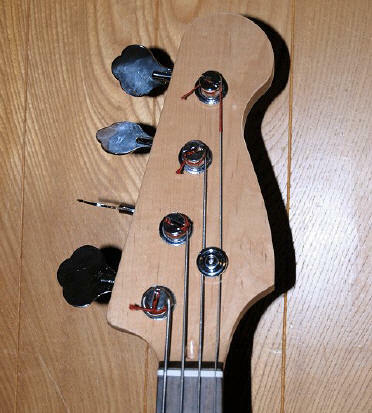 The neck was cut out on a band saw to mimic the classic Jazz Bass lines on the tuner head. The fingerboard was taped off and then fine sanded to 600. I then lightly lacquered about 2 coats and wet sanded from 400 to 1200 after curing. No polishing. It is a semi-soft gloss and extremely smooth to slide up and down the scales. The finger board was finished with two coats of tung oil. Each was rubbed in by fingers and then wiped down later. That enhanced the wood color and should protect the wood from my oily fingers. The tuners were lined up, but of course several holes were offset. That is easy to fix by filling the offset holes with glued in toothpicks & leveling. Then I redrilled the missing holes, a 1/16" bit, by mounting the tuners with the existing correct holes and carefully tapping the new holes with waxed screws. I assembled it all and used a different set of light bass strings than what came with it. Tuning and intonation was a breeze. The E string was the only pesky thing for some reason. The others were virtually right on. The whole action height and pickup height was very close upon assembly so it took very little time to adjust anything. It made the rounds at work and after an hour and a half of playing by various musicians everyone was very happy and exceeded all expectations. Great site you have to share everyone's ideas. My building job has set other friends of mine on a task to do a similar Saga project in the near future.My wood working web page Viking Wood World and it has my Saga Bass link at the bottom for my project. BTW, I have several Stratocaster style guitars that I acquired for and raw wood bodies from various other sources to start a few new projects. These are not Saga's even though I suspect some parts probably come from the same Saga supplier. Great job, Jerry and we love your website!